Tuesday: AM: Intervals: 2 x 400m with 800m rest, then 2 x 800m with 800m rest. My stupid treadmill kept tripping the surge protector again. I’m not sure why it does that… if it says it goes 12 mph, then shouldn’t it go 12 mph without kicking me off?! Not cool. I’m pretty sure I ended up with 6.5 miles total, if I did all my math right after having to start over several times. PM: 45 minutes strength. I get a new strength routine this coming week, and I’m not too sad to see this one go. I didn’t love it. Thursday: Intervals at 10k pace: 2 miles at goal pace with 0.4 miles recovery, the 4 x 1-mile with 0.4 recovery. 9 miles total, then stretching. Friday: 45 minutes strength. I SO BADLY wanted to run, but I was good and followed the plan (for once). Saturday: 9 miles. The weatherman had been saying all week that the weekend temps would be in the upper 50s, so imagine my disappointment when we topped out at 40 with 15-20 mph winds. Actually, I wasn’t that disappointed, since it was finally above freezing and most of the ice had melted. Sunday: 4 recovery miles plus core. Pretend there is a smooth transition here. It was a good weekend, and I want to show you some pictures. I heard something about Friday’s being a holiday? 🙂 J and I don’t really care about Valentine’s Day, so we made breakfast-for-dinner and watched the Olympics while I looked at fall marathons online. It was pretty ideal. We went out for dinner for a friend’s birthday Saturday night. I actually fixed my hair and figured I’d better document it to prove that it does, in fact, happen. Today, we went to Denver for brunch and an afternoon at the History Colorado Center with my brother and his girlfriend. We decided to do this instead of exchanging Christmas gifts, and this weekend our schedules finally aligned. This museum is fairly new, and I’d never been. It was a lot of fun — lots of interactive exhibits and interesting info. I definitely recommend it if you’re in the area! 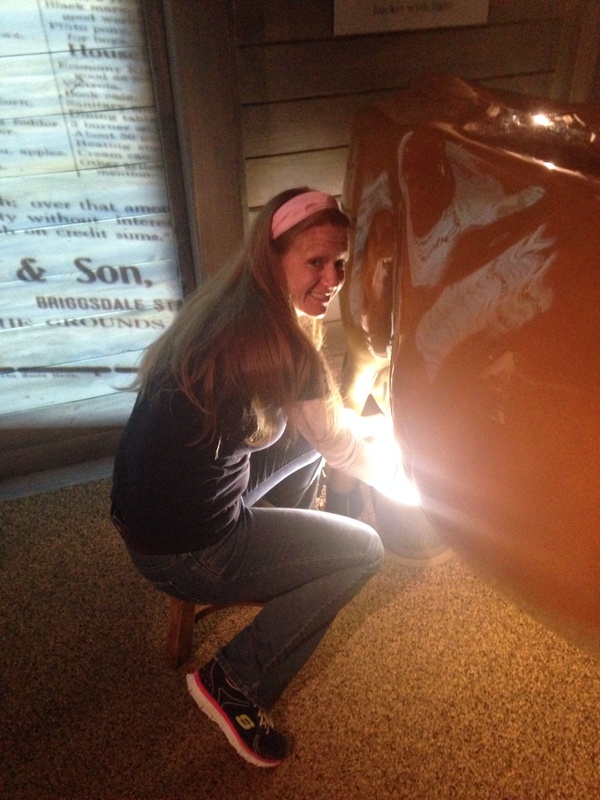 I’m milking a plastic cow. The bucket lights up as you “fill” it. 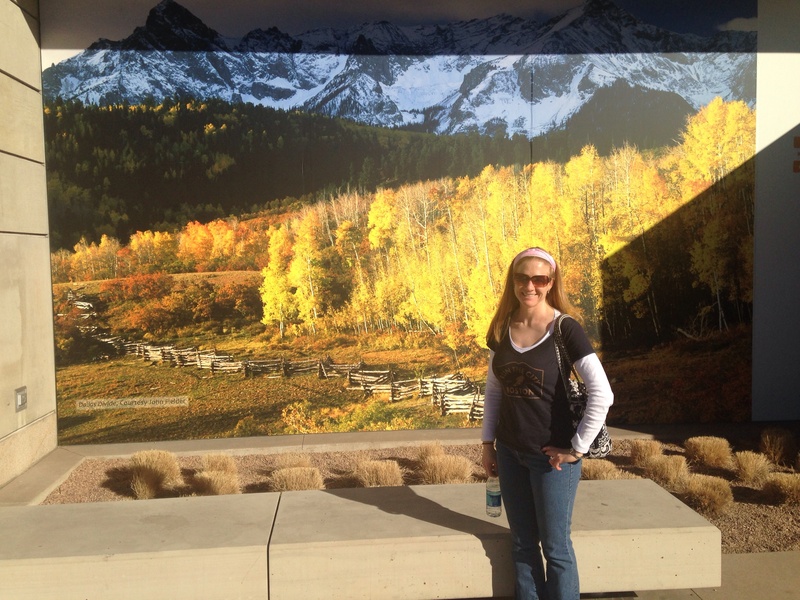 This is outside the museum, but those mountains are over by where I grew up. I miss them! 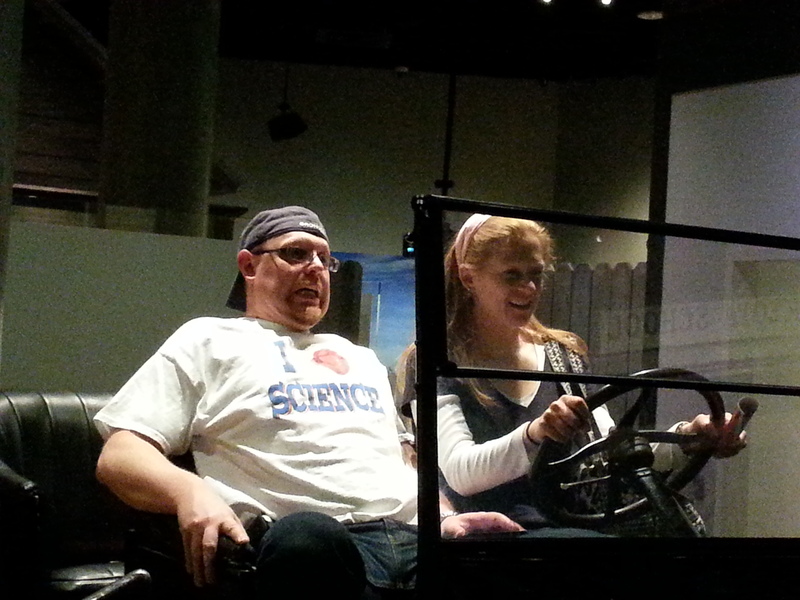 Jordan is terrified of my driving in this Model T.
And that was the weekend in a nutshell! We have tomorrow off, which is awesome. Of course, I have to spend most of it grading, but at least I can grade on my couch, in my sweatpants, with my coffee, instead of squeezing in grading before and after school, huddled by my space heater. Do you like museums? What’s the best one you’ve been to? Way to go on following your training plan! And that museum looks fun–some day I will have time on a weekend that is not filled with house-related stuff + squeezing a run in to actually enjoy where I live. I’ll have to check it out. What a fun weekend! I love museums! 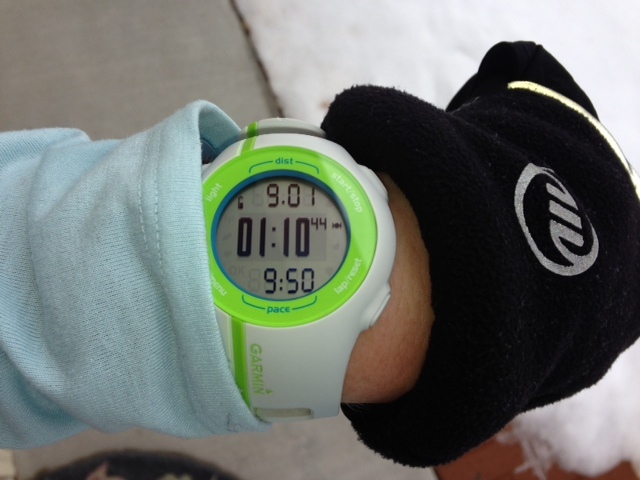 Yay for your 10k training! I am actually starting to train for a 10k and I am super super excited! I needed a race!! This week is vacation for educators in NY. The students have winter break. I’m trying to keep myself busy all week by updating my resume and applying to jobs! Your hair is absolutely gorgeous! I love your weekly recaps because they motivate me. You are always such a beast during the week. Especially on top of teaching HIGH SCHOOL. Agh. I’d want to just lay down for the rest of my life if I taught one day of high school. 😀 I can’t wait until your 10k. I love museums. A fun, quirky one in Denver is the Denver Museum of Miniatures, Dolls and Toys. If you’re not into miniatures, the historic house is interesting to wander through. There are even exhibits in the bathrooms. Hair is looking good! It’s a beautiful color, too. I work today but that’s due to all the snow days we have had so I cannot complain one bit! I don’t go to museums a lot. I guess the coolest ones were in DC. I don’t remember all the ones we hit up, but there was one that had cool things like Dorothy’s shoes from the Wizard of Oz, a bunch of dresses the first ladies wore and things like that. I’d love to go back to the museums in DC … I went in high school, and I think I’d be so much more appreciative now. Nice jobs on the pictures! I will have to try to make it to that museum soon since I am in the area often! Yea for having Monday off! Sounds like you had a great weekend! Your hair looks awesome! How long did that take? Thanks! 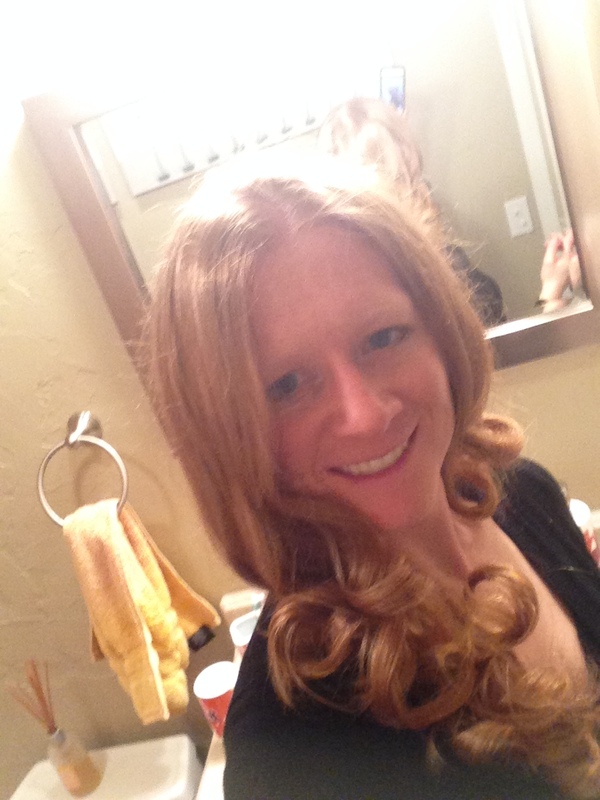 I have hot rollers so it didn’t take all that long … but I only have enough for half my head at a time. So probably 20 minutes or so? One of my favorites was one of the Smithsonian Museums in DC – I think it was called Early American. That was one windy day you had to run on! It’ll pretty much be windy here from now until June. But that’s okay because it means spring is on the way! Thanks. 🙂 I’m just too used to marathon mileage! This week is a recovery week, and I’m like… wait, what? Recovery from what? Haha. Nice job sticking to your running plan. This morning I felt like I could have kept running but I cut myself off at planned miles for the day. I don’t want to burn out on my next workout! Don’t you love those runs where you have to stop yourself? That’s the best feeling.